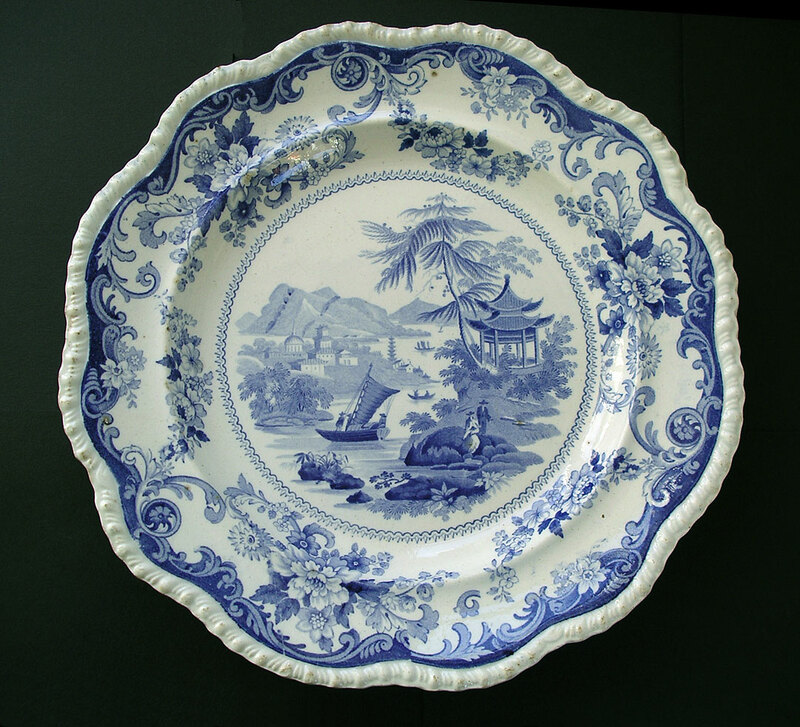 "Wonderful decorative quality, antique Staffordshire blue printed earthenware plate with gadrooned edge from the Elkin, Knight and Bridgwood partnership at Fenton 1827-40. The pattern is an attractive pastoral landscape Canton Views and is named to the reverse in cartouche. A popular pattern name also used by other manufacturers for quite different designs. 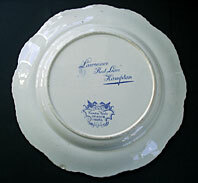 Of particular merit is the unusual extra backstamp "Lawrence Red Lion Hampton" which refers to what was a prestigious hotel/inn in Hampton, Middlesex. An unusual example and highly collectable as personalized hand stamps of this type are fascinating, unusual and rare." Antiques Expert Hamilton Bear. References: Lawrence was the family name of former owner(s) or landlord and is recorded in Victorian directories. The Red Lion Hotel street scene circa 1900 can also be found on a popular Edwardian tinted picture postcard which is not too difficult to find. As far as we can ascertain the Red Lion Hampton is today no longer in business or trading under another name? Dimensions: width 260 mm max. about 10.2 inches. Marks: fully marked to base as illustrated. Condition: Excellent a wonderful example.. Good clear pattern with no restoration. Typical tiny stilt marks to front of plate left by kiln furniture removal and presence of minor impurities from firing. Just one small flat chip near edge to reverse at 7.00 o'clock which does not show from the front. You are unlikely to fond a better display example.